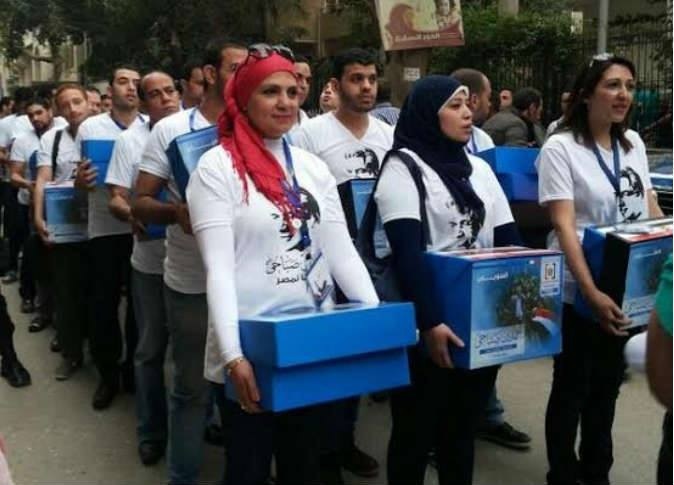 ( a group of youth carry the required legal recommendations for Sabahy’s candidacy. Egypt’s leftist politician Hamdeen Sabahy has become the second candidate after ex-army chief Abdel-Fattah Al-Sisi to formally join Egypt’s presidential race. The Sisi/Sabahy presidential race evokes memories of the farcical Mubarak/Ayman Nour election in 2005. Nevertheless, some perceive Sabahy’s challenge as a brave one. However, regardless of the intentions of the military-backed interim authority and how it will conduct the presidential race, Sabahy has no choice now but to make the most of his presidential bid. Sabahy’s real challenge is neither the conduct nor the outcome of the 2014 election, but whether he can provide a workable civil model for the governance of Egypt. During this election campaign, Sabahy faces a tough test. He has two options: either he plays the underdog, the victim of Sisi dominance, and proceed with a muddled campaign full of rhetoric and exchanged accusations that will probably earn him some sympathy and support, and probably a credible second position. Alternatively, he can grasp the opportunity history has offered to challenge himself and the wider society to address some tough questions about the foundation of contemporary Egypt. As a country that has been shaped by chronic rivalry between militarism and Islamism, Egypt badly needs a different, third approach to society and politics. Sabahy ran a good election campaign in 2012, and therefore has gained some valuable experience. However, much has changed in Egypt since 2012. He faces a dual challenge: many of his previous supporters, now in a divided constituency, are now backing Sisi. Then there is the challenge to win over those Egyptians who still resent the removal of Morsi on July 3 last year, and whom Sabahy strongly supports. In addition, on a deeper level, Sabahy is facing what Morsi faced before, the inability of a civilian president to reconcile the state’s basic pillars under the leadership of a complete outsider. The past few months have also shown how the judiciary has gone astray, particularly after endorsing a constitution that literally federalises the state’s institutions. To bring this federalisation of institutions under a democratic civilian leadership and conduct the necessary checks and balances is a challenging task. In terms of the economy, Sabahy is known for his opposition to IMF loans and for his leftist tendency towards state-owned projects. This Nasserite-leaning attitude will go nowhere in addressing Egypt’s economic woes. Sabahy has to address three tricky elements, as Daniel Stoker wrote: Foreign assistance, an austerity plan, and state versus free-market policies in addition to the current energy and water crisis. A modified Nasser format will not be enough to solve the current dire economical circumstances. Moreover, Egypt’s economy has become increasingly linked to the Gulf States’ support. Such a debtor status cannot easily be reversed in the foreseen future, which begs the question, can Sabahy appeal to Gulf donors with his populist-style economic plan? Donors and foreign investors are looking for a confident leader with a clear approach, who can stabilise the market and offer better opportunities for investment. On the social front, Sabahy is facing a society with a completely torn social fabric struggling to accommodate its pious conservative nature in its eclectic liberal tendencies; this is a society that has been exploited by the political religious right and by the fake, secular elitist left. As a presidential candidate, Sabahy has to articulate how he can help Egypt recalibrate and achieve a balance between the freedom of individuals and the rights of society. Furthermore, the temptation in any two-horse race is to appeal to voters on the basis of their antipathy to the other candidate. The liberal Dostour party and many youth groups are backing Sabahy, not because they agree with his leftist platform, but because they reject Sisi, the “military” candidate. The pitfall for such an approach is that it sends a signal of potential future fallout between such alliances of convenience. In 2012, Morsi effectively played the same tactic against his opponent, Shafiq, and won the backing of many non-Islamists, only to turn against them later. The public in Egypt has no appetite to test this approach again. They are after stability, not future bickering. In a nutshell, Sabahy needs to focus on the task at hand and not the rival. With such an attitude, he can give hope to the youth who back him and the other political parties that put aside rivalries in order to support the only civilian candidate available. If Sabahy manages to produce a solid, cohesive plan without flowery rhetoric, then his project will not die, even after electoral defeat. People do not vote for autocrats because they love oppression, but because they lack alternatives. Sabahy can be the alternative, but only if he truly wants to be one. This entry was posted in Diary of Aak, Egypt. Bookmark the permalink. How will he counter the rigging! The point in my argument is to focus on the project, not the election. It is pointless to win an election without a ready project to implement, but losing a rigged election will not kill ideas and plan, but t can galvanize the public, and rally support.